The Battlefield Fortress is a Subspace Emissary stage in the game Super Smash Bros. Brawl. As the outside of the castle is seen, many arrows and catapults are laying around in the sand. 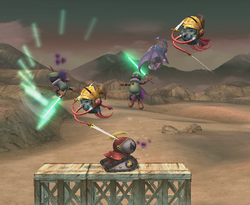 A Subspace Bomb is seen, with two R.O.B.s activating the bomb. The Ancient Minister had dropped the bomb, and while he floats away with another bomb, many Primids pop out from the sand, heading towards the castle. Atop the castle, Marth raises his sword, then ventures from the inside of the castle to the outside. Later, he stands in front of Subspace, but he glares to the right after hearing something. He prepares his sword, and Meta Knight flies downwards, engaging in a sword fight. This is soon interrupted by Primids, who jump on the back of the two, are cut in half by both swords. Marth and Meta Knight form a team, and defeat the army of Primids. They then chase the Minister, whom has another bomb. The two try to cut the bomb off of him, but fail. However, Ike jumps and slashes (using his move Aether), which cuts the connection of the bomb to the Minister who escapes. The three swordsmen then head to The Wilds. Ike, Marth, and Meta Knight join. This page was last edited on December 14, 2018, at 12:54.